Intel Core i7-6700K Skylake Processor Review - Legit ReviewsIntel Core i7-6700K Processor - Our First 14nm Skylake CPU Review! 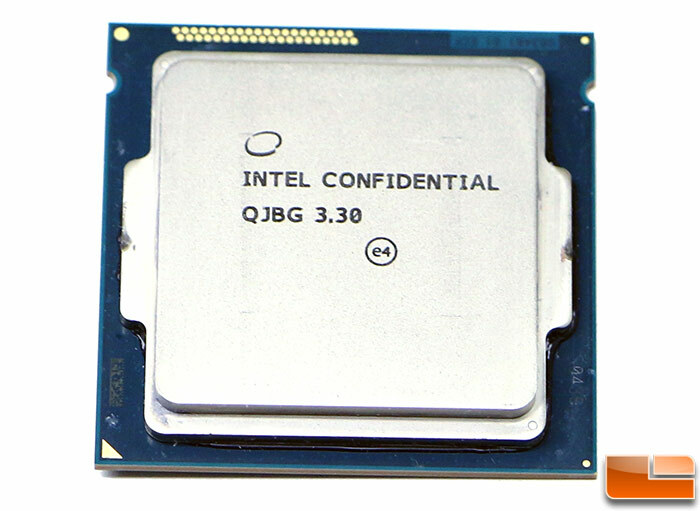 Intel Core i7-6700K Processor – Our First 14nm Skylake CPU Review! Intel today launched the 6th Generation Intel Core i7-6700K and Core i5-6600K processors along with the Intel Z170 at Gamescom in Germany. Intel released these two new 14nm ‘Skylake’ unlocked K-Sku processors at Gamescom to show that Intel remains dedicated to PC gaming. Intel believes that this is the ideal gaming platform, offering the best all-around gaming experience. The ideal desktop gaming platform right now, according to Intel, would be a 6th Gen Core processor with a Z170 based board and an Intel 750 Series NVMe SSD to top it off. Many of the Intel Z170 boards will feature SuperSpeed+ USB 3.1, Thunderbolt 3.0 and DDR4 memory and up to three M.2 PCIe SSD slots, so you are talking about the most feature rich mainstream PC platform to ever be released. 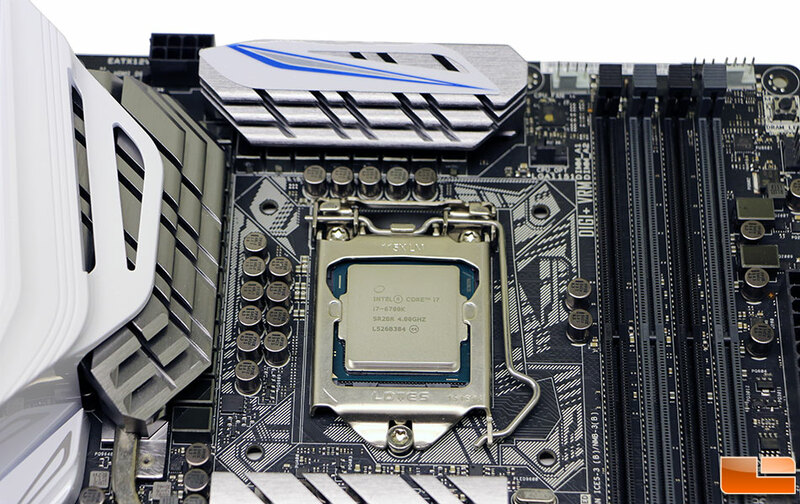 Chances are if you consider yourself an enthusiast you’ve been waiting for the Intel Z170 boards with the new LGA1151 socket and DDR4 memory support to come out before you upgraded. There is a large number of Intel Sandy Bridge owners out there that haven’t felt the need to update, but that will likely change now that this new platform has been released and they see the performance numbers. Intel is launching these two new Skylake processors and the Z170 PCH for the desktop market, but didn’t fully brief us on the new Skylake architecture as they wanted to save those details for unveiling at the Intel Developer Conference that takes place later this month on August 17th in San Francisco, California. This is a little unique as usually we get white papers and gobs of details ahead of Intel releasing a new processor architecture. 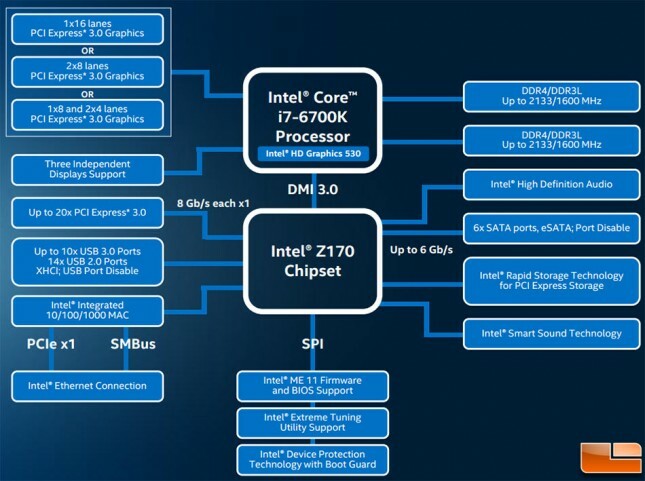 What we do know is that this generation of processors has been in the works for six years and Intel has unleashed these two desktop overclocking-friendly, K-Sku processors first, with the full lineup of desktop and mobile iterations launching at a later date. The full top to bottom release of the rest of the 6th Gen Intel Core Processors and supporting chipsets will be announced sometime in Q3 2015. We also know that our Intel engineering friends and the board makers are much more excited about Skylake coming to market than Broadwell. In fact, you’ll likely be able to purchase a 6th Gen Intel Core i7-6700K before you can buy a 5th Gen Intel Core i7-5775C retail boxed processor, so that just goes to show how weird the move to the 14nm process node has been for Intel. What we can tell you is that the Intel Core i7-6700K quad-core processor with Hyper-Threading as a 4.0 GHz base clock and a 4.2 GHz maximum turbo clock thanks to Intel Turbo Boost Technology 2.0. This socket LGA1151 processor has 8MB of L3 Intel Smart Cache and no eDRAM with a 91W TDP. The integrated graphics included on this processor are Intel HD Graphics 530 and it features a dynamic clock that can run up to 1150 MHz. The Intel HD Graphics 530 solution supports DirectX 12 and Feature Level 12_1. 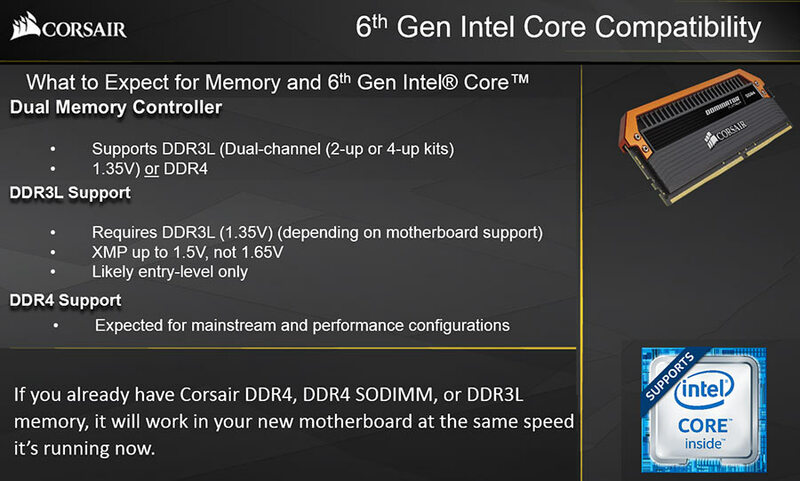 The processor is obviously a ‘K’ Sku and is fully unlocked with new full range BCLK tuning options for overclocking. The recommended price on this flagship 14nm Skylake processor is $350. 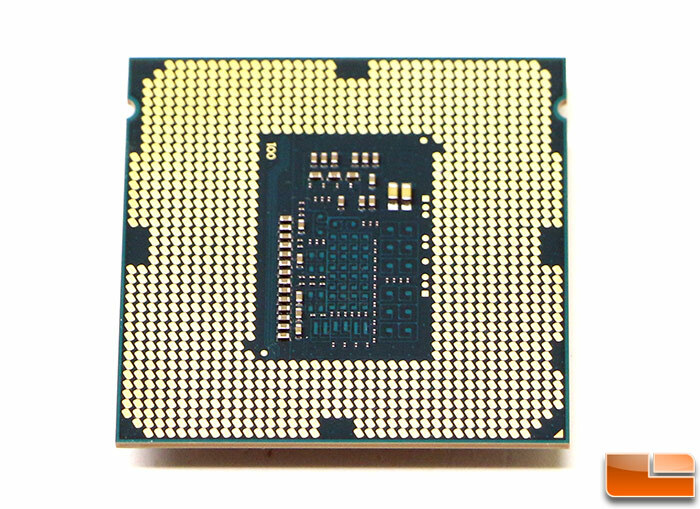 For those looking some something a little more affordable the other 6th Generation Core processor launching today is the Intel Core i5-6600K at $243. This processor utilizes the same core architecture, socket, memory support, number of PCIe 3.0 lanes and TDP as the 6700K, but has a lower base and turbo clock frequency, no Hyper-Threading and just 6MB of L3 cache. This part is still fully unlocked and should be popular amongst mainstream gamers that are looking to be a solid mainstream gaming PC with a single GPU. Intel is very happy with the overclocking capabilities of the Intel Core i7-6700K and Core i5-6600K. In our very information limited briefing with Intel we were told that these processors should be good overclocking processors just like Sandy Bridge was back in the day. We’ve been told that 4.7-4.8 GHz should be possible on most all of the 6700K’s and that some will even be able to hit 5 GHz with very good aftermarket cooling (think custom cooling loops with triple rads) and some extra voltage (1.5V instead of the stock 1.3V). There are now 83 core ratio overrides available and the base clock is adjustable in 1MHz increments from 100MHz up to 200MHz. The motherboard makers can opt for either a discrete base clock or have it integrated (PCH) and there is no more PEG/DMI ratio to worry about as the PEG/DMI domain has been isolated. FIVR is also gone and the voltage regulation is being done on the motherboard again, so we expect to see increased differentiation between high-end boards that are aimed at overclockers. When it comes to memory performance the dual-channel DDR3L/DDR4 memory controller that is being used on Skylake is said to be stupid fast. Intel Skylake processors have a dual memory controller that supports both DDR3L (low voltage 1.35V DIMM support) and DDR4 memory, so there might be a handful of DDR3L boards running around out there although we haven’t seen one yet. Intel officially supports DDR4 overclocking up to 4133 MHz, but Corsair has already reached over 4200 MHz on pre-production boards. Corsair used a pre-production 3866MHz memory kit on the Gigabyte Z170X-UD5 motherboard to hit this overclock. Many factors are involved in the higher clock speeds; for starters it’s only a dual-channel solution, but most importantly, the new memory controller and processor architecture have been designed to support higher clock speeds, thus providing a substantial increase to the the clock frequency ceiling over the Intel X99 platform. We’ve also heard a rumor that FIVR in Haswell E might have been causing the limitation and that now with the voltage regulation being moved back to the motherbaord that the clock frequency ceiling limitation has been removed. Corsair and G.Skill were the first to release 3600MHz and beyond memory kits and both are using Samsung ICs. We’ve talked with a couple memory companies and they believe that 4500 MHz to 4800 MHz DDR4 clock frequencies will be reached by the professional overclockers by the end of 2015. It will be interesting to see what kind of bandwidth will be possible and if there are any real world applications that can utilize all that bandwidth. To get the most from the Intel Core i7-6700K and Core i5-6600K you’ll need to use the new Intel Z170 chipset. This is the only new chipset for the initial LGA1151 platform launch and it has some pretty big changes under the hood. The first major change is that Intel has updated the Direct Media Interface (DMI) to DMI 3.0. The Intel Z87 and Z97 chipsets used for Haswell and Broadwell featured DMI 2.0, which had four 5 GT/s lanes routed between the CPU and the PCH using 8b/10b encoding. The new DMI 3.0 has four 8 GT/s lanes with 128b/130b encoding, which means that there is theoretically 60% more bandwidth (36 GT/s versus 20 GT/s) between the Skylake processor and Z170 PCH. Moving from PCIe Gen 2 to PCIe Gen 3 for these lanes is a big deal as it really opens the door for connecting more bandwidth hungry devices to the PCH. Since each PCIe Gen 3 lanes top out at 8 GT/s or 985MB/s you are looking at a theoretical speed cap at 3940 MB/s between the CPU and the Chipset and means that you’ll be able to use a PCIe Gen 3.0 x4 M.2 AHCI or NVMe storage drive on the chipset without being limited by anything. One interesting thing that we learned about the Intel Z170 chipset is that it is built using the same 32nm process as Z97 was done on, but the power is up from 4.1W on Z97 to 6.0W on Z170. We weren’t expecting a 46% increase in the TDP for the chipset, but it’s likely because of the move from PCIe Gen 2 to PCIe Gen 3 lanes. We got a single Intel Core i7-6700K processor to test and have spent the past week using and benchmarking the latest socketed desktop processor from Intel. This processor idles at 800 MHz when your system is not being used and then can run at up to 4200 MHz depending on the workload. The Intel Core i7-6700K is a 91W TDP processor, so ignore the 95W TDP value shown in CPU-Z as it is incorrect in this build of the program. 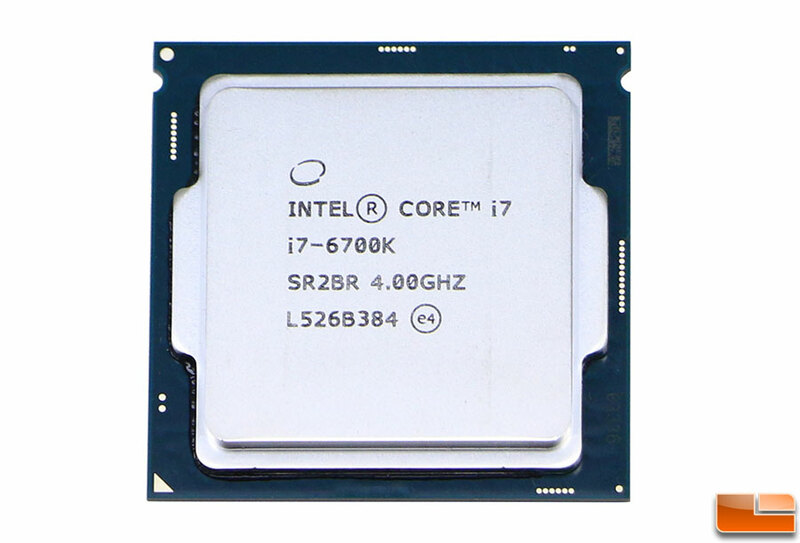 Here is a look at the Intel Core i7-6700K 4.00GHz processor and on the Integrated Heat Spreader (IHS) it has the clock speed shown on it without much else. This particular Intel Core i7-6700K CPU has an S-spec of SR2BR and a batch number of L526B384. 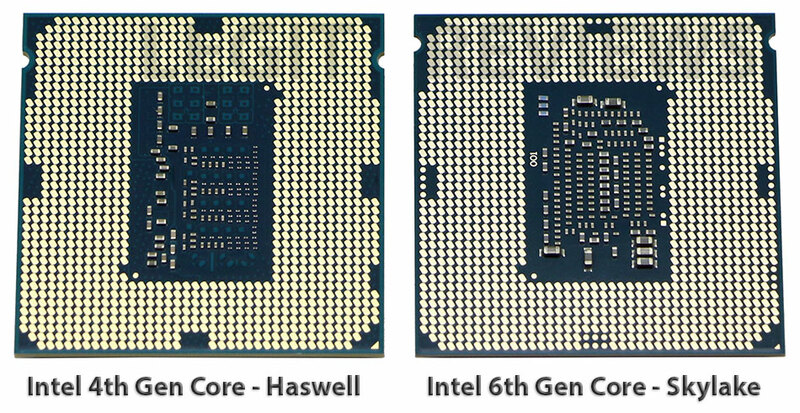 Flipping the processor we wanted to compare our Intel Core i7-4790K Haswell processor (LGA1150) to the new Intel Core i7-6700K Skylake processor (LGA1151) to show the pad arrangement and that the ‘keys’ in the processors are in different locations. As you can see, the Intel Core i7-6700K has the usual capacitors that reside in the middle around the pins needed to operate in an LGA1151 socket. 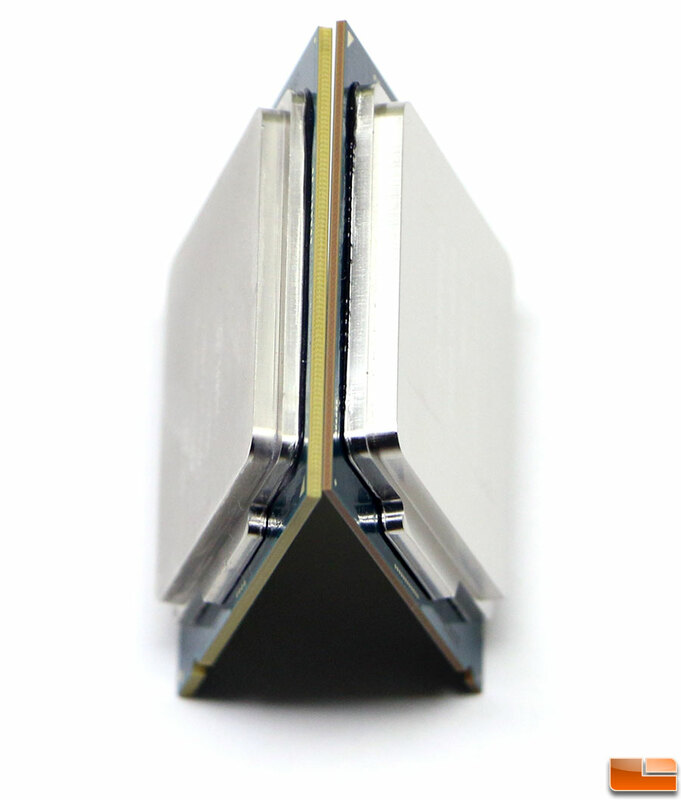 One of the things we noticed right away is that green PCB is about 33% thinner on Skylake, but the overall thickness of the processor is the same as the Integrated Heat Spreader (IHS) is thicker to ensure no heatsink change was needed. The package was able to be made thinner since FIVR has been removed from the CPU and the voltage regulation is being done again on the motherboard. We also believe this was done to allow for thinner mobile devices as many mobile processors don’t have an IHS and this thinner processor will lead to thinner z-height design for tablets, laptops and so on. Intel refused to talk about specific architecture features, how many Execution Units (EU’s) that the Intel HD Graphics 530 has and the thinner packaging of the processor. 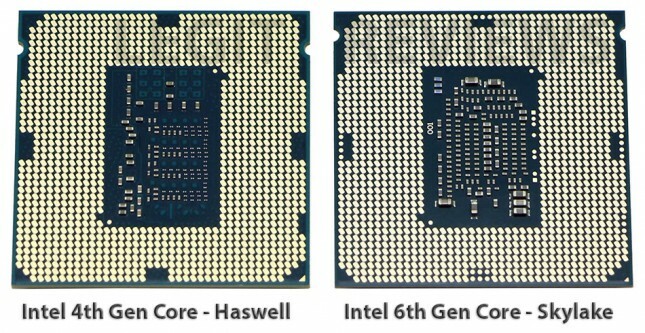 Intel said that ‘more details regarding the 6th Gen Intel Core processor family will be available at the processors entire family introduction later this year’. Let’s take a look at the ASUS Z170 Deluxe motherboard that we’ll be using to benchmark and test our 6700K processor on!